Is there such thing as a gourmet dish that you make in your crockpot? Not all foodies and dictionaries agree on what defines the word ‘gourmet'. Many different interpretations. Some feel that cooking food outside of a microwave is considered gourmet (I find this funny). 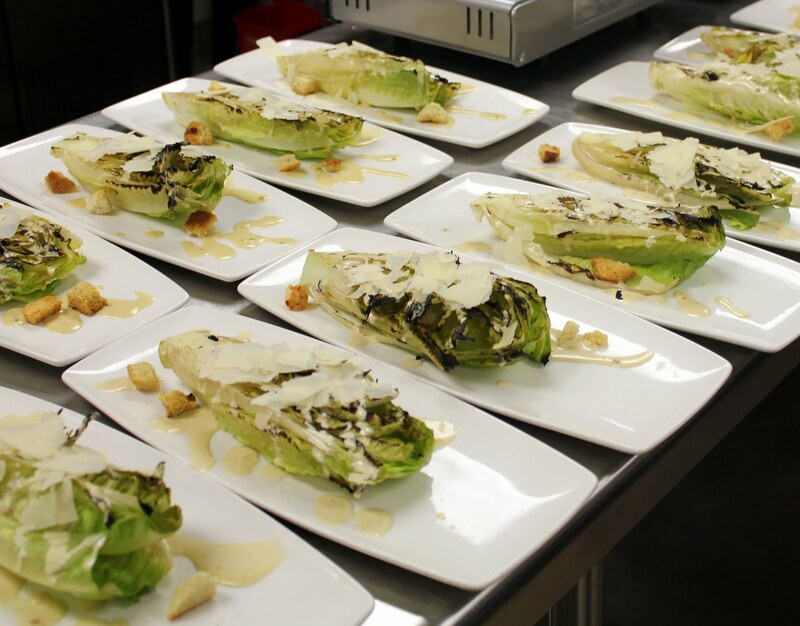 Others interpret gourmet as utilizing fresh, non-processed ingredients. Some foodies believe that you need to utilize an actual culinary technique in order to classify a dish as ‘gourmet’. For purposes of this recipe we’ll use the definition of gourmet as the utilization of fresh ingredients to create a unique tasting dish. The ‘culinary technique’ of throwing ingredients into a crockpot will be used. That’s a technique, right?!? Broad interpretation, but hey – this must fit for a slow cooker recipe. A few months ago my dear friend Jackie handed me this amazing recipe from her purse. It’s a recipe from Weight Watchers, of all places! What I like about this recipe is that the ingredients are unique to my slow cooker. Before this recipe I hadn’t cooked lamb in my crockpot, nor had I used cinnamon in my crock pot (or chickpeas). This recipe also keeps well in the refrigerator, so I almost always double the recipe to make extra for leftovers. And yes, I’m a fan of the slow cooker. Some days I don’t have time to create an elaborate dish. I feel it’s totally okay to throw ingredients into a crockpot, and come home to a savory delicious dinner. The main addition I have to this recipe is that I serve the stew over a bed of polenta. The polenta adds a little texture and fills me up a little more than the lamb and chickpeas. Plus, the stew juices soak into the polenta - - yumm. Cut lamb into 1-inch chunks. Place lamb and remaining ingredients into a 5-quart slow cooker (except for lemon juice). Stir well. Cover and cook on low for 7 to 8 hours. When cooking is complete, squeeze fresh lemon into the stew. Serve over warm polenta. her lead the pack of culinarians behind the Pacci tent was mesmerizing. She’s a young, good looking female executive chef, which is a rare find to begin with – but to boot she had on this sleeveless wife-beater shirt and aviator glasses which did nothing but add to the drama of her onsite creation of her dishes. It seemed that every 10 or 15 minutes she was coming up with a different dish that she wanted to showcase. There was never a dull moment in her booth; her area was the only one that consistently had a line of eager foodies. 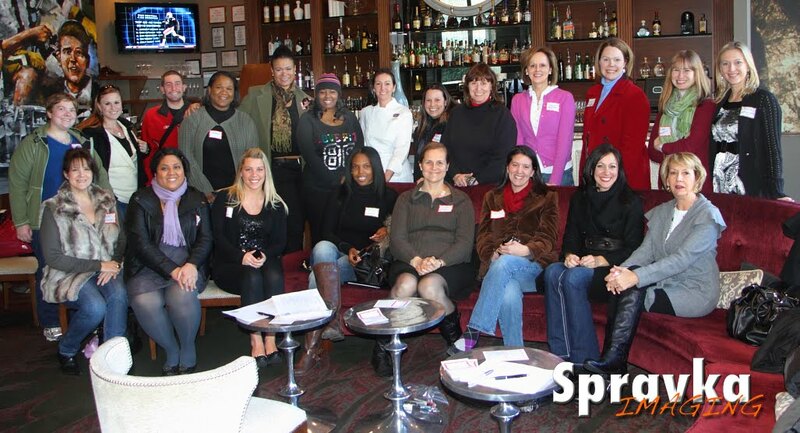 After tasting her delicious bolognese, polenta, pork belly, mushroom, corn and other variations, my parting thought as the new President/Leader of the Atlanta Food Bloggers’ Alliance was that I needed to engage this woman for an event. on Saturday afternoon at Pacci. 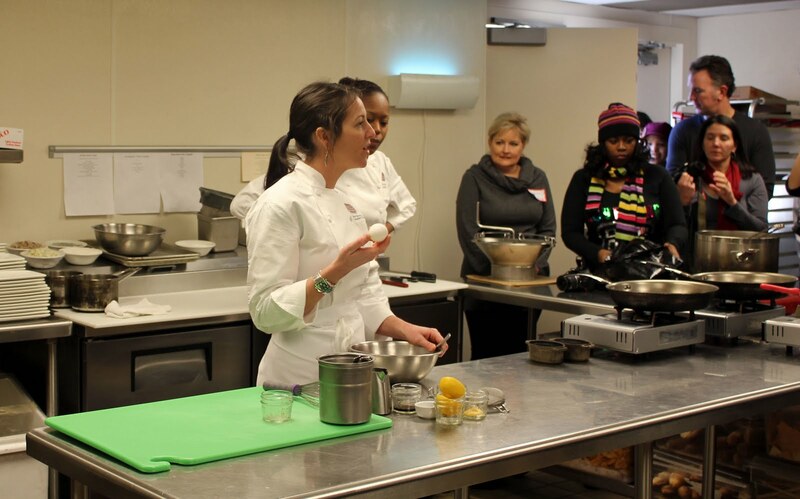 The networking part of the event was held in Pacci and the demo and tasting was upstairs in the garden lounge and demo kitchen at AltoRex. 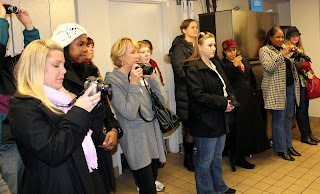 The weather was a little chilly and windy, so after the first course we stayed in the demo kitchen to devour our tastings. What I loved about this tasting is that we truly had a three course meal - - the tasting portions were meal size. 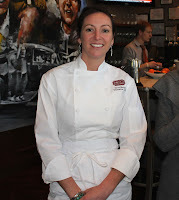 Chef Keira demo’d three courses of ‘Classic’ Italian dishes: a Caesar salad, Gnocchi, Crespelle, and Homemade S’mores. Interestingly Chef Keira touts that most of her dishes have 5 or fewer ingredients. Her belief is that when you add too many ingredients, the taste of those ingredients can become lost in the dish. We were also given the recipes for each dish. In my journey to become a self taught chef I will definitely be trying these out in my kitchen (all while utilizing the great tips that Chef Keira shared during the demo). I’m a little intimidated by anchovies. I’ve never worked with them, but she makes it look so easy! She also grilled the romaine lettuce with a little olive oil to give the caesar salad a delicate charred taste. Secret to brown butter: put the butter in a pan over heat. Cook the butter until it just starts to turn brown, then take it off the heat and the warm pan will finish browning the butter (too much heat and the butter will blacken and burn). Chef Joey (or Yo-eeee as Chef Keira called him) said that there’s nothing worse than burnt black butter – I couldn’t agree more. 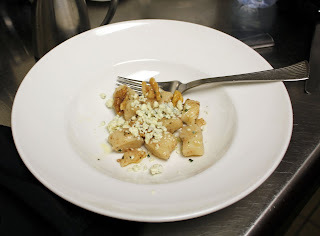 This gnocchi was AMAZING - - soft and decadent, not even slightly chewy. I learned that another word for a Crepe is Crespelle. Chef Keira gently cooked the crepe in a small omelet pan, and sprayed the pan with vegetable pan spray (instead of butter) to prevent sticking. I was quite impressed with her crepe flipping skills – sans spatula she flipped the crepe in the pan similar to a handless omelet flip. It’s all in the wrist. 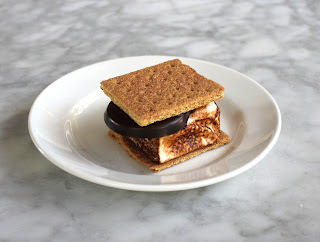 It was a little windy to use the Alto Rex fire pits to roast our marshmallows, but Chef Keira had a back-up plan . . . a blow torch. She literally thought of everything! 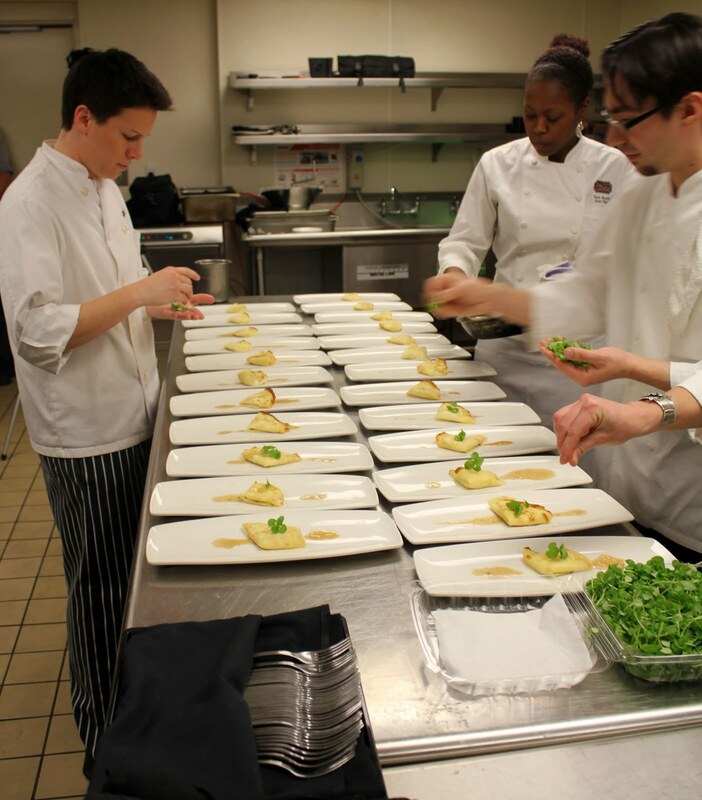 chefs follow her lead to plate exactly as her first demo plate. This ensures the first and last plate presentation look identical. 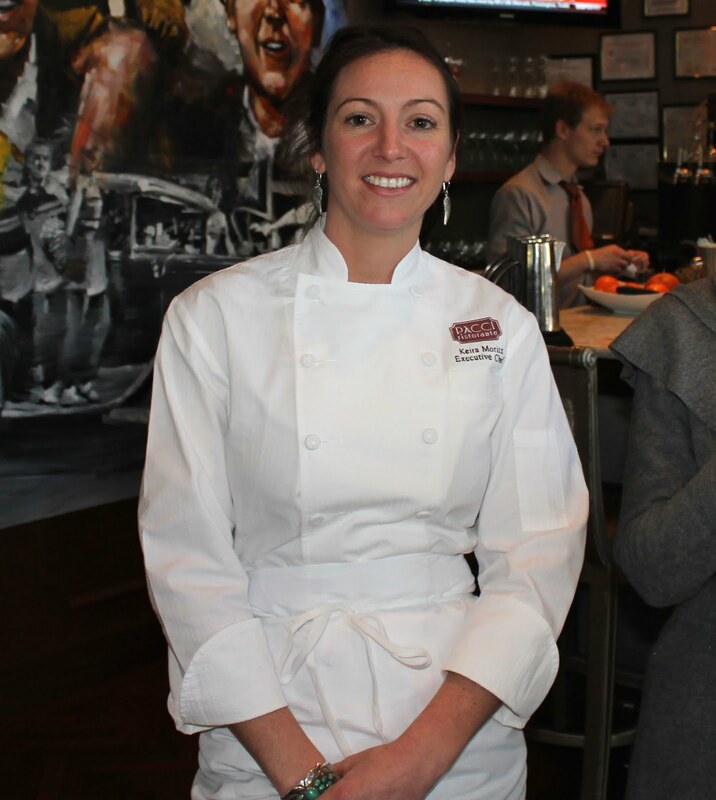 I have to say, if I ever needed a top notch restaurant/hotel in Atlanta to host a luncheon, dinner, birthday, company meeting – hands down, without a doubt I would choose Pacci and the culinary team under Chef Keira Moritz. Do I have a girl crush? Yea, maybe. My husband sure thinks so and has already brought that fact to my attention. Am I really that transparent?!?! 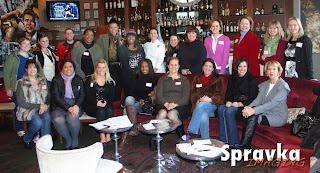 It was an honor to host such a wonderful event for the Atlanta Food Bloggers’ Alliance. Chef Kiera went above and beyond, and she made me look good. She seems to be the type of person that no matter what culinary project she’s tackling, whether it’s a foodie event, a tasting, a large banquet or a single guest in her restaurant, she gives 110% effort to ensure perfection in the food and experience that she delivers. Have you ever cringed after paying $35 or $40 or more for a little birthday cake that you purchased from a bakery? Don’t get me wrong, I appreciate the pastry chef who went to school for all those years to produce the delicate masterpiece that I will be slicing and devouring for my birthday party. But, it’s hard to spend money on something that you know is so inexpensive to make. It can’t be that hard to bake a cake, right? Not a boxed cake from Duncan Hines. 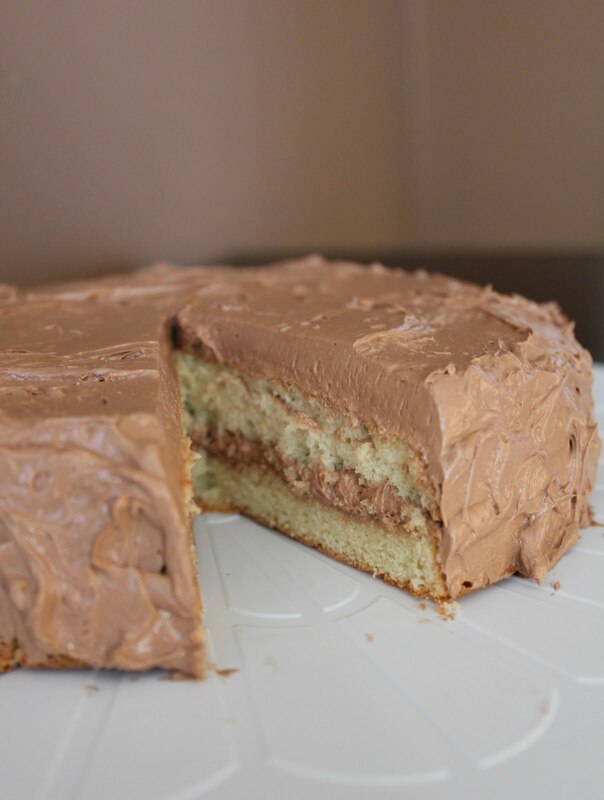 I’m talking about real cake from scratch. I didn’t know where to start such an endeavor. Until this weekend. For the first time I watched the famous foodie movie, Julie & Julia . What a GREAT film. I could totally identify with the main character, a food blogger. How did I miss this movie? The main character and I are the same age and my husband and I have had very similar conversations as the two main characters in the movie. I’ve had meltdowns in the kitchen, similar to Julie – especially after dropping a whole chicken on the floor (and a boiling pot of mashed potatoes). Finally a movie where I didn’t have to explain myself and my love of food = = these people get it. In addition to the movie, my family also gifted me a copy of Julie Child’s “Mastering the Art of French Cooking ” for Christmas. Such thoughtful gifts that I can’t wait to dissect! And towards the back of my new cookbook . . . a dessert section. I want to bake a cake. 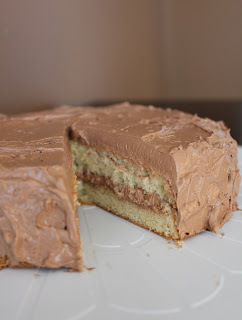 A simple cake with chocolate buttercream frosting. Julia Child, let’s try your spongecake. You need: 9 or 10 inch round cake pan . Butter and flour the cake pan. I used softened unsalted butter to butter the pan, then lightly floured the pan and pat the extra flour out of the pan into my sink/trash. Melt 4 Tablespoons of butter in microwave. Set aside to cool. In a mixing bowl, beat 2/3 cup sugar and 4 egg yolks, add 2 tsp vanilla extract and continue beating for several minutes until the mixture is thick, pale yellow and forms ribbons. Scoop one fourth of the egg whites over the top of the egg yolk and sugar mixture. Sift on one fourth of the flour, and delicately fold until partially blended. Add another fourth of the egg whites and flour mixture . . . repeat until all eggwhites and flour have been incorporated. Then fold half of the melted butter into the mixture. When partially blended, fold in the rest of the butter but omit the milky residue at the bottom of the butter cup. **Do not overmix; the egg whites must retain as much volume as possible. Turn into prepared cake pan, tilting pan to run batter to the rim all around. Set in the middle level of a preheated oven for 27-35 minutes. Cake is done when it has puffed, is lightly brown, and has just begun to show a faint line of shrinkage from the edge of the pan. Remove from oven and let stand in the pan for 6-8 minutes. It will sink slightly and shrink more from the edges of the pan. Gently place the cake on a cooking rack and cool for at least an hour before frosting. Chocolate Buttercream Frosting Adapted from “Mastering the Art of French Cooking "
This is for frosting and filling a 9 inch sponge cake. Chop semi-sweet chocolate in the small pieces and melt over low heat in a saucepan until melted. Rinse a mixing bowl in hot water, dry it, and place all the ingredients listed. Beat at a moderate speed for about 5 minutes to obtain a smooth cream. Chill until the cream is cold but still malleable, then fill and ice the cake.